#China lacks the manpower and training to handle an epidemic of #mental illness. #China averages only one psychiatrist for every 83,000 people, much less than the norm for industrialized countries. 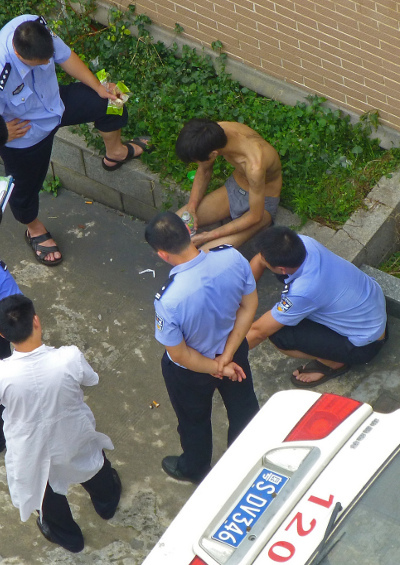 China has a complex history in the treatment of the mentally ill. In 1849, the first mental institutions in the country were founded by western missionaries. One of them, Dr. John G. Kerr, instituted some principles which are still valid today. Among those principles were the following: mentally ill patients should not be blamed for their actions. They were not in a prison but a hospital and should be treated as human beings, not animals. During the Cultural Revolution, political shifts led to strong civil control over diagnosis and treatment — a change that overshadowed patients’ real needs. Many mentally-ill patients were sent to labor camps because of their “counter revolutionary behavior.” Western models of treatment were gradually introduced only after Deng Xiaoping reformed the nation. Today, serious problems remain. China faces high numbers of mentally ill patients, inadequate services and lack of trained personnel. China recently adopted a new ”mental health law” that — although it contains some important provisions to benefit the patients — does not allow them the right to a legal hearing through a mental health tribunal or guarantee them legal representation. Mental health professionals and human rights organizations have criticized the law. According to a study by The Lancet, roughly 173 million Chinese suffer from a mental health disorder. One hundred fifty-eight million of those have never received professional help for their disease. The need for psychiatrists, however, is growing. According to The Lancet, the incidence of mental disorders had increased more than 50% percent between 2003 and 2008. Although some of these cases can be due to improved diagnosis, most cases likely result from more stressful life conditions. These stressful conditions may be one of the causes for the increasing number of violent crimes. In 2010, China suffered a series of copycat attacks on kindergartens, with tens of children being stabbed to death. As a result, Yin Li, vice minister of Public Health, said that China would build 550 mental hospitals to care for mentally ill people. In 2009, the World Health Organization (WHO) stated that mental illness – which affected 7% of the population — had overtaken heart disease and cancer as the biggest burden on China’s health care system. The spectrum of mental illness is broad and spans from minor conditions such as anxiety to serious illnesses like depression, obsessive-compulsive disorder and other problems that may lead to drug addiction and serious crimes. Depression is China’s second most commonly diagnosed disease and has a huge economic cost in terms of lost work days and medical expenses. In recent years, depression has replaced schizophrenia as the most common mental disease at China’s top mental health facility, Beijing’s Anding Hospital. According to some estimates, more than 260 million people were struggling with at least mild depression in 2011. Depression-related deaths such as suicides even exceed traffic fatalities. In 2007, China’s Medical Association estimated that two-thirds of depression sufferers had harbored suicidal thoughts at least once, and 15 to 25% ended their own lives. As the number of mentally ill people increases in China, efforts to expand insurance coverage haven’t kept pace. According to some statistics, in recent years only 45,000 people have been covered for free outpatient treatment and 7,000 for free inpatient care. This is a vastly inadequate response to a serious problem. In Beijing, almost 90% of mental patients do not receive inpatient treatment, either because it is too expensive or because hospitals do not have enough room for them. Huge needs in the treatment of the mentally ill have led to an increase of unregistered and inadequately trained psychologists who are unable to provide proper diagnosis and treatment to the patients. As a result, many patients end up with a worsening of their symptoms. The lack of professionals in medicine and psychology should be addressed. The Ministry of Human Resources and Social Security is now expanding the country’s professional ranks by modifying criteria to certify mental health counselors. These counselors can treat patients suffering from minor depression symptoms and thus alleviate the work of psychologists and medical doctors who could address more severe cases. However, additional steps should be taken. Beijing should recruit foreign doctors to help train local students in mental health. At the same time, the government should build more mental health facilities and improve insurance policies to help those patients in greater need. The Chinese government should treat mental health needs as the emergency it truly is.